Bileeta (Pvt.) 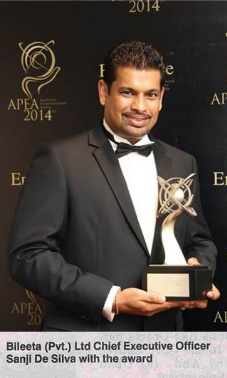 Ltd Chief Executive Officer Sanji De Silva won the Emerging Entrepreneurship Award at the prestigious Asia Pacific Entrepreneurship Awards 2014 held recently. The Asia Pacific Entrepreneurship Awards is a regional recognition for outstanding entrepreneurs across Asia. The ceremony is a platform for Asian business leaders and entrepreneurs to network, share information and form lifetime alliances. A highly experienced and respected IT solutions designer and developer, De Silva has worked in large US companies such as MCI and APAC where he was exposed to Subscriber Billing and Call Center solutions. In 2001, he was Co-founder/Director and CTO of Duo Software, a leading provider of enterprise solutions for the Asia Pacific region, providing Subscriber Management, Customer Care, Billing and Contact Center Management solutions to corporations in highly competitive industries. There, he was the architect of the world’s fastest Pay-TV billing system which later became a preferred solution for the Pay-TV industry in the region. In 2010, along with co-founder Sanka Weerasinghe, De Silva started Bileeta, an organisation providing Enterprise Resource Planning solutions to corporations around the world, focusing on simplifying the user experience of enterprise applications. Bileeta uses state-of-the-art technology which empowers organisations to reduce operating costs, secure and increase revenue and drive profitable growth by delivering best business practice modeling capability along with insightful and analytical financial reporting which highlights process inefficiencies and supports operational and strategic decision-making. Over the past four years the company has expanded its cus-tomer base with exciting and innovative solutions across a scale of industries, both local-ly and internationally, including manufacturing, pharmaceuticals, projects, sales and distribution. De Silva’s astute business strategy focuses on providing this diverse portfolio of cli-ents with the lowest Total Cost of Ownership of its customized ERP solution, which will be successfully implemented within stipulated time line and budgets. Under his leadership, Bileeta has gained local and international recognition by winning the National Best Quality Software Awards in 2011 in the e: Logistics and Supply chain category, was nominated to represent Sri Lanka in the Asia Pacific ICT Alliance Awards in Thailand in 2011 and was selected by ICTA to represent Sri Lanka in the `CeBIT exhibition in the same year. His vision for Bileeta is lim-itless. Through his passion and dedication he is set to go beyond traditional boundaries to position Bileeta amongst the best in business.